This November, use social media for good and make progress toward your fundraising goals by getting #GivingTuesday trending. #GivingTuesday is a chance for nonprofits to capitalize on the virality of Black Friday and Cyber Monday to orient the upcoming holiday season as one of not only getting, but giving. And, as the hashtag suggests, #GivingTuesday is a great opportunity for nonprofit organizations to put their social media marketing strategies to work. But what if your organization doesn't have a social marketing strategy, or what if you haven't updated it in several years? You shouldn't let #GivingTuesday pass by without making sure you have a social media plan for this year. Using the platforms that work best for you. Telling, and spreading, your story. If you are wondering where you can start improving your social media strategy this season, these best practices will get you well on your way. Choosing the right social network begins with identifying your target audience as well as your peer to peer and general fundraising goals. But also think about which network falls most in-line with the way your organization naturally communicates. Does your organization have lots of updates or rapidly evolving work happening on-the-ground throughout the day? Maybe Twitter is a good fit for your nonprofit. Or if you work with lots of compelling people who are willing and able to articulate powerful, personal stories, maybe creating YouTube videos is a good place to start. Each social media channel has its own language and the more the flow and pace of your organization matches your chosen social network, the more likely you’ll be able to start and grow it over time. And take on one new social network at a time - get comfortable with it before moving on to the next. Keep in mind that you can’t just copy and paste what you wrote on one platform directly to the other. Customize messages for each platform, the way you would for different target audiences. Pro tip: Remember to co-brand your social media and donation page(s) with #GivingTuesday! Try posting news releases one day and switching to something light-hearted the next. The goal is to try new things until you figure out what balance triggers the most meaningful conversation with your target audience. Also find creative ways to engage your supporters - consider social media events like #GivingTuesday as an opportunity to grow your fan base. For example, try hosting a contest to see who can raise the most money. The contest will get more people engaging with your organization and if you ask them to share/retweet your content as part of the contest that will create more reach for you. Plus people love the competitive nature and winning free stuff! In preparation for #GivingTuesday, make sure to get started early with your social media marketing so you can experiment with strategies and find one that your supporters love. Use your platforms to let supporters know what you’re doing and why. Be creative - make a YouTube or Vine video of your fundraising efforts, or Instagram a picture of your volunteers or the people you are helping. Also tell supporters exactly where their donation will be going and what it will be doing (i.e. Your $50 contribution will feed a child dinner for 7 nights). Let them know that their money is going to good use. ...And encourage people to share them. Make them interesting and relevant enough that people want to share them with their friends. A good question to ask yourself: Would you share this with your group of friends? Why or why not? Your supporters don’t have to share your content, but you can do your best to make sure they want to. Reach out to social influencers in your industry so they can share it with their followers. Get the word out about your cause to as many people as possible. The larger the reach, the better! Make sure to continually engage with people by commenting back, answering questions, tweeting at people, etc. And once supporters have made a donation, don’t forget to thank them! Remember your donors as well as partners, volunteers, and influencers. It’s so easy to do with just a simple shout out, and it makes the world of a difference. Have a brand image, repeatable phrase/quote and hashtag to go along with your posts. You want people to be able to recognize your brand and cause and also be able to search for it. The more timely, the better! Give supporters a strong reason to donate now and not click away. With any call-to-action, it’s important to be realistic. For instance, it’s highly unlikely that someone who stumbled across an image from your organization on Pinterest for the first time is going to be ready to donate. Not to mention that people who aren’t ready to make a donation right off the bat may even be put off by an immediate request to do so. So, take it slowly and think about where your piece of content falls on your ladder of engagement. 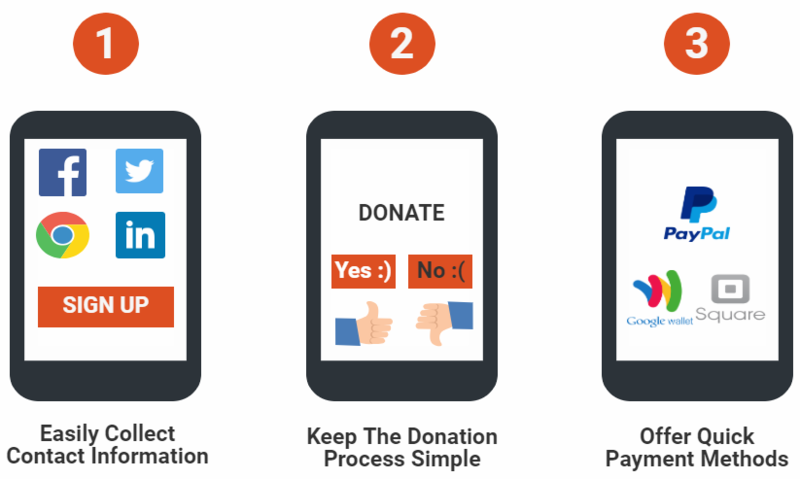 By asking people to take a lower-level action now, that requires less dedication or engagement, you can actually move them further along the ladder to create loyal supporters who are more likely to donate in the long run. Answer the questions: why me? why now? To summarize: Content marketing is about broadening your reach by creating valuable content designed specifically to attract and engage a clearly defined audience of supporters. Including a call to action is key for deepening engagement and signaling to supporters what you want them to do next. Once supporters see the importance and relevance of your content, they become more likely to be loyal supporter. Social media is all about the present, and if you can’t capture attention right now, then you may have already missed your opportunity. Emphasize why donations are necessary. Share real-time updates of the progress of your campaign and invite supporters to help you reach your goal.